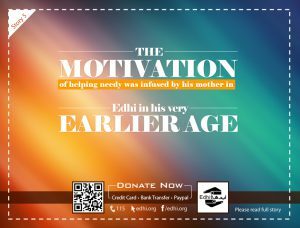 Edhi was on his way to Maddrassah (religious school) in the morning, he saw that few of the students – appeared his schoolmates were pestering a poor man, who is in a highly pitiable condition – in ragged cloths, scruffy hair, and without shoes sitting on the sidewalk. The poor man was surrounded by a cartel of students, yet poking him with a stick. After seeing this situation, he hid behind the water tank lying on the nearby, and was observing them thoroughly. Those outlaws were poking him by portraying frightening contours, by screaming similar to tiger growls, with a view to harass him, one by one teasing him with a stick. In the meanwhile, the helpless man tried to decamp from the grip of the annoying students, and tried to wriggle out from their hold, he ran in an encircled position. In the meanwhile, Edhi stopped one of the pokers, and wanted to give advice to him. Upon seeing this, all others appeared attentive to him. Edhi said, in case you aren’t going to do any good to him, why you are poking him, it isn’t fair. 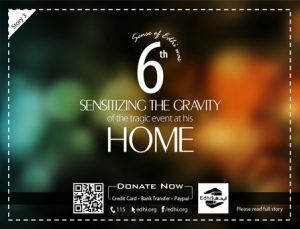 They instead of taking a good note, they emerged as the violent, so the fight erupted between Edhi and those arrogant boys. 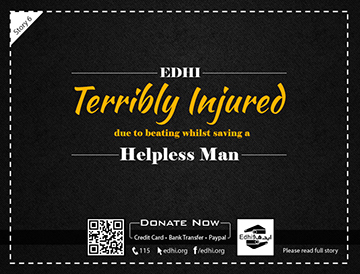 Although Edhi tried his best, to beat them, yet they were in bigger number, thus contained him and was beaten badly resulted in bruises and injuries on his body. He came to his home, by seeing his condition, mother understood that he has come across any squabble, thus she washed his wounds and fairly treated with his bruises. In the meanwhile, Edhi let her know what was happened with him. On hearing the story of the scuffle between him and the group of students, she praised that he has done a good job, to save the poor man, to such extent he went through the beating and injuring. The story indicates a lesson that Edhi was ready to go to extreme levels, for the protection of poor, when he sees that anyone is taking a ruthless action against any poor. In the current era, people don’t take notice of these situations. Edhi, you are the man of principles, you are the man, who has born to support and give protection to the needy and helpless people!!! Good, better, and best!! !